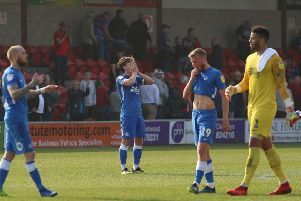 Graham Westley is ready to give the managerial performance of his life to ensure Peterborough United enjoy more success. Westley beat off stiff competition to be named the new Posh boss this week. The former Preston and Stevenage manager insists he is proud and honoured to be given the task of leading Posh back into the Championship. “This job doesn’t scare me, it excites me,” Westley announced. “I’m proud to have been appointed manager of a great football club and I am determined to carry on the club’s tradition of entertaining, attacking football. “I know what Posh stands for and I will embrace it. I will put my own stamp on it. But I will remain true to the club and its fans who want to see a winning team play good football. Grant McCann remains at Posh as Westley’s assistant. Westley’s first game in charge is at Bradford City on Saturday.